Yes, I am enrolling for the entire series. Native Americans – A Day in the Life in the Simi Hills: January 23 from 9:00 AM to 1:00 PM. Plants in the Simi Hills: January 30 from 9:00 AM to 1:00 PM. Archaeology in the SSPSHP and Geology of the Simi Hills: February 6 from 9:00 AM to 1:00 PM. All Aboard! Take a ride on the Butterfield Line past the De la Osa swing station and on up the Devil’s Slide and right on through every western you (or your parents) ever saw as a kid: February 20 from 9:00 AM to 1:00 PM. 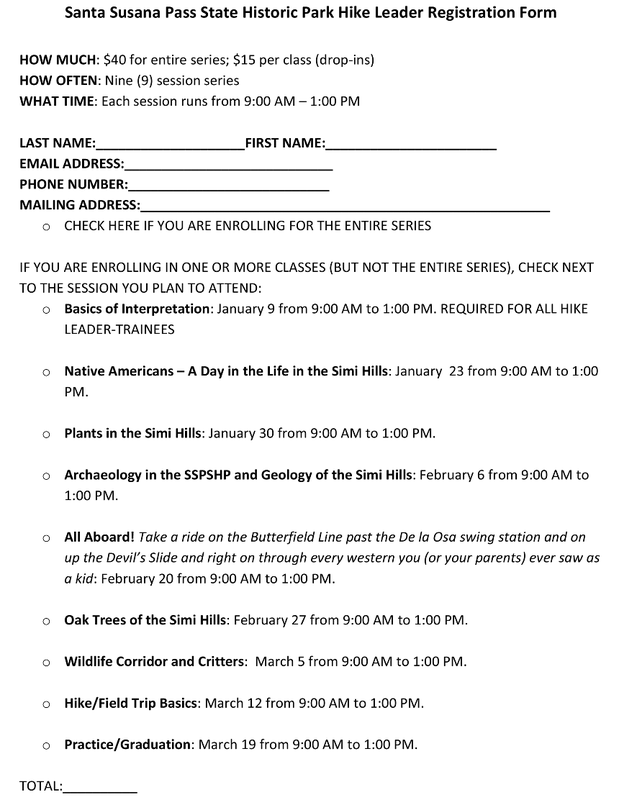 Oak Trees of the Simi Hills: February 27 from 9:00 AM to 1:00 PM. Wildlife Corridor and Critters: March 5 from 9:00 AM to 1:00 PM. Hike/Field Trip Basics: March 12 from 9:00 AM to 1:00 PM. Practice/Graduation: March 19 from 9:00 AM to 1:00 PM. Please pay here for Hike Leader Registration.